Replete with historical significance and spiritual symbolism, a Russian Orthodox Christian Priest’s liturgical vestments set him apart from other clergy members. 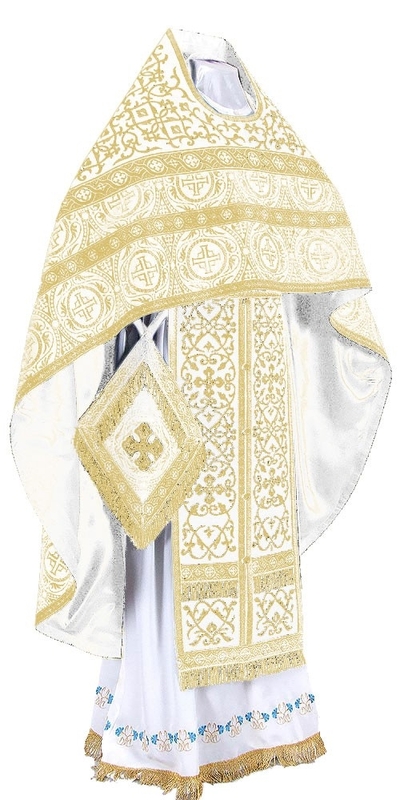 Istok Church Supplies carries a fine selection of Russian Priest vestments white-gold that add to the visual splendor of churches and transform wearers into dignified representatives of the Kingdom of Heaven. Although a variety of colors are used for liturgical vestments today, the color white still holds its significance as a symbol of radiance and purity. 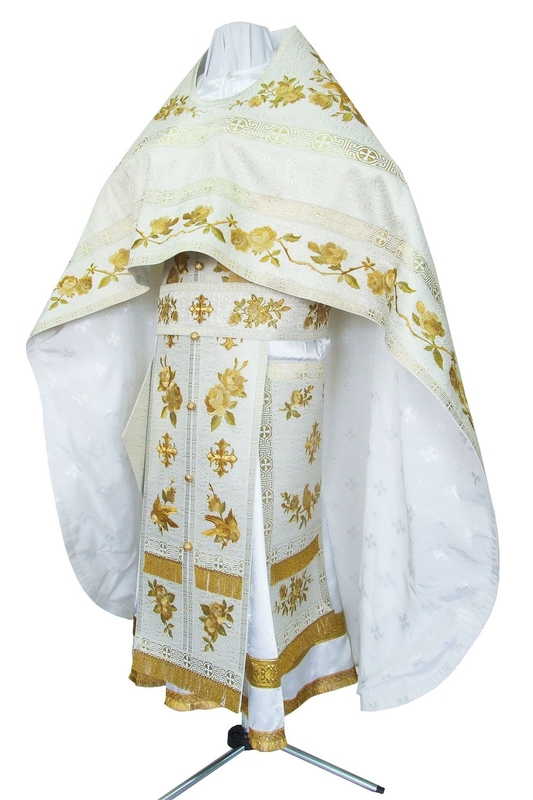 Our Russian Priest vestments white-gold are perfect for use during the Paschal period and for days and feasts honoring the Lord Jesus Christ. 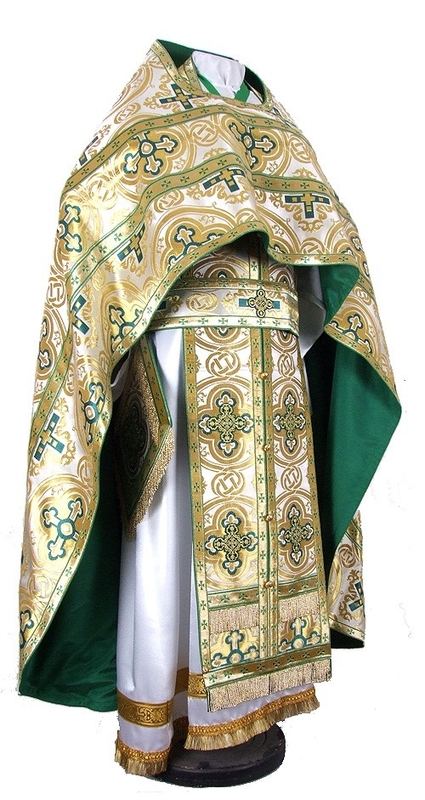 These splendid vestments are made from top quality ecclesiastical fabrics such as metallic jacquard brocade, rayon jacquard brocade, natural German velvet and fabrics with elegant hand embroidery. We offer lovely patterns and motifs on these fabrics to make them even more beautiful. Fabrics are divided into various classes and customers can choose depending on their budget and taste preferences. 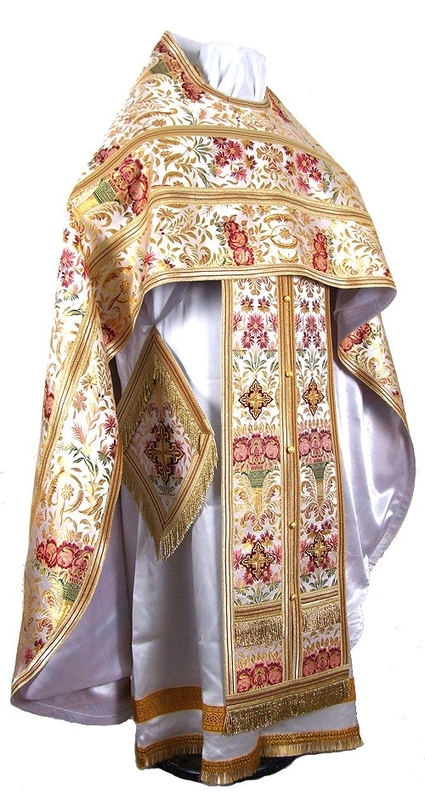 We provide Russian Priest vestments as complete sets so customers don’t need to buy each item individually. We include six articles – phelonion, epimanika, epigonation, epitralhilion, zone and nabedrennik and provide natural rayon lining for these vestments. Customers can upgrade their orders by selecting matching chalice covers, natural velvet inserts and an embroidered icon that will go on the back of the garment. Customers can customize orders by selecting from three types of adornments – standard, premier and luxury. Adornments include galloons and crosses. 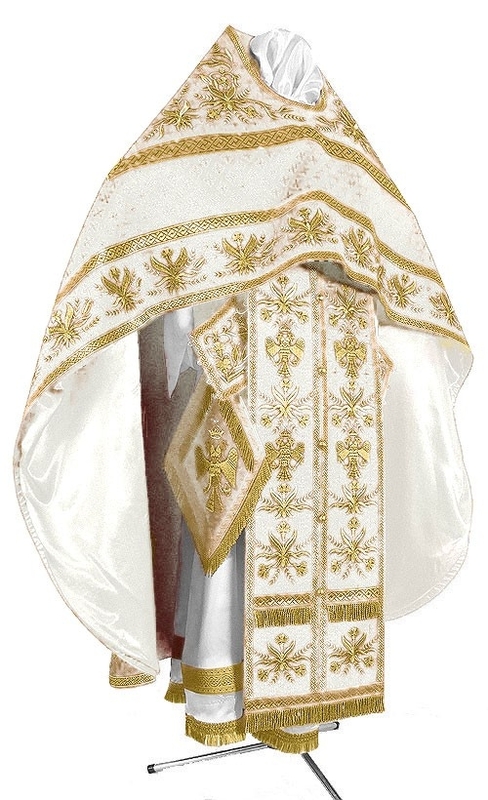 Each of our Russian Priest vestments white-gold can be custom tailored to fit the wearer perfectly. We request customers to go through our online measurement chart and provide precise measurements. Our skilled ecclesiastical tailors with respect and knowledge of vestment traditions will execute custom orders with excellent workmanship and painstaking attention to detail. We require a few short weeks to deliver bespoke orders. Kindly place your orders at the earliest if you need them for a special occasion. We have made every effort to make browsing and order placement a hassle free experience. We are sure you will agree!